There’s no way around it, you’re getting a surgical incision in the abdomen and uterus. So prepare yourself for the brightly lit operating room, the IV drips and the epidural. The good news is, today’s medical staff usually go to great lengths to make you and your partner feel comfortable and at ease. Some will even give you options about how much of the operation you want to see. If it’s a planned c-section, there’s usually a sense of calm control about the whole thing. Emergency c-sections can be more rattling. Either way, you’re in good hands. Everyone tells you that you won’t feel a thing. They’re wrong. You do. It’s not pain – it’s just sensation. Firstly they make the incision, which can feel a bit like they’re unzipping the skin. Then the wild part: your doctor will reach in and remove the baby, and honestly (stop reading now if you’re queasy), it really does feel like they’re rummaging around in there doing the plates and cups. Or at least that’s what was going through my mind. It’s pretty incredible, and then just like magic, there’s the baby. Unlike a lengthy days-long natural delivery, a c-section operation follows a snappy, well-rehearsed game plan. All going well, the procedure itself only usually lasts about ten minutes. Which can be mind-boggling, when one minute you’re lying there with a huge belly, and the next minute your baby is being lifted into the world. The lengthiest part of the process actually comes after the delivery, when the doctors and nurses will need around 30 minutes to stitch you back up. No doubt, your midwife or obstetrician will prep you on what to expect post-surgery. But the reality is a lot tougher when the pain medication eventually wears off and you start feeling the very real pain around your incision. It can literally take your breath away. And you might wonder how on earth you’re going to look after a newborn while also nursing yourself back to health. You will, and you do, and the pain does ease off. Just brace yourself for those first few difficult days. We all bear our own personal scars from pregnancy and child birth, but the c-section scar is distinctive and it can look pretty raw. At first, the area might be quite itchy, since the nerves in the area have been disrupted. It’s also normal for the area to feel numb or tingly, which tends to go away over time. Give your body time to heal, eventually the scar fades and just becomes part of who you are. You might even end up being quite proud of your battle wound. 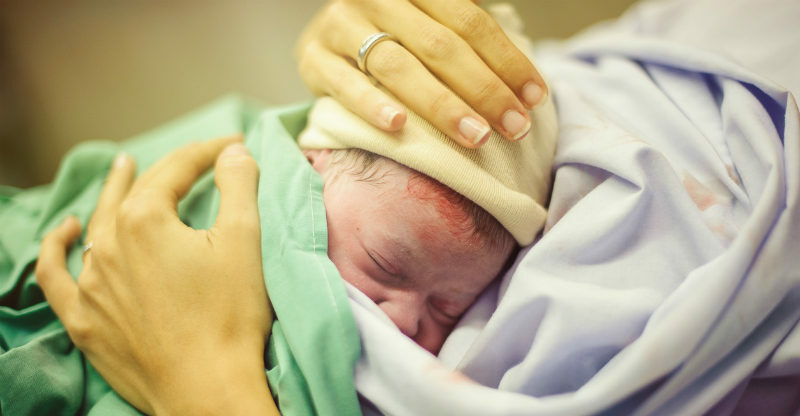 Despite all the discomforts of a c-section, nothing matches the moment you see your baby for the first time. The operating room melts away, and trust me, all you will see is that incredible little person. Good luck, and stay strong. Footnote: We don’t all get to choose our delivery method. Sometimes a c-section is thrust upon us, and they can be marvellous, but they can also be traumatic. Same goes for natural deliveries. Whether you deliver your baby by c-section or vaginally, you’re doing the most amazing thing in the world. How about you? What was your c-section experience?